Click a tab below to learn more! 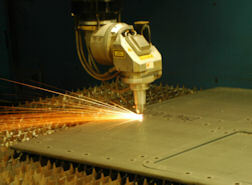 Our CNC Lasers can handle metal, wood, plastics, & rubber. Supply your own or we will handle your material acquisition for you. 24,000 Sq. ft of machining excellence serving the mid-Atlantic region. AMT is a full-service metal forming and manufacturing company. Need a prototype? Our complete conventional machine shop can design and build your prototypes from small brackets to complete industrial machines for numerous industries. One call. One solution. On-Time and On-spec. AMT. We can handle all your manufacturing and sheetmetal needs! Design. Build. Deliver. Our dual lasers allow us to handle up to 5'x10' sheets. We can cut metal, wood, plastic, and rubber. Mild steel up to 7/8", armor plating to 3/4", 3/8 aluminum, and 1/2" clean cut stainless. We have the capacity to handle all your JIT manufacturing needs. With over 5,000 square feet to manage stock and JOBBOSS JIT scheduling, we can deliver your parts on-time. AMT has complete CAD/CAM design services available. Provide your own DXF or supply us with your blueprint, sketch, napkin, or sample and let us turn it into a professional CNC grade CAD file ready to be manufactured. Our advanced nesting services ensure the maximum parts from your material reducing material waste and lowering your costs. Design, cut/machine, assemble, and deliver -- It's all here! One stop. One supplier. Simplify your business world by choosing AMT. AMT can handle your needs starting with precision CAD/CAM design through delivery to your door (within our delivery area), AMT can do it all for you. AMT uses state-of-the-art Computer Controlled machines. Lasers, Turning, Press Brakes, Saws, and Milling services are all CNC controlled. That means fast and accurate production quantities of your parts. Perfect for JIT schedules. AMT can handle whatever your job size. We have many customers who use our services as a custom fabrication facility for one-time custom parts. Other clients use us for their JIT manufacturing with AMT providing production level quantities on a scheduled basis.